Sweet Chaos Home: Room Updates... Finally! Happy Friday!! I am finally re-emerging from the depths of remodeling hell and thought I'd share the latest and greatest from the living room/dining room/foyer makeover. It just may go down in history as the slowest project on the blogsphere. If you need a refresher on what the heck we're even doing, you can read about it here, here, here, here and here. It's been a long process, but the floors are finally installed on the main floor. As with every project, we hit a bit of a roadblock. The treads were refinished, but there was one piece of wood that almost cost me $7,000. Like I said, it's a long story. Stair treads are red oak. Stair landing was supposed to be finished in the new maple flooring. Annoying piece of oak wood was 1/4" lower than new maple flooring. Annoying piece of oak could not be removed. Landing would look funky with this one annoying piece of wood not matching and not at same height. Stair expert said he couldn't remove the annoying piece of wood without removing the entire handrail, and oh by the way, both staircases are not to code and should be replaced to the tune of $7,000. Code schmode! I'm not shelling out $7,000. Plan: order new red oak in the same height as annoying piece of wood to use on landing. Have it sanded and stained to match stair treads. 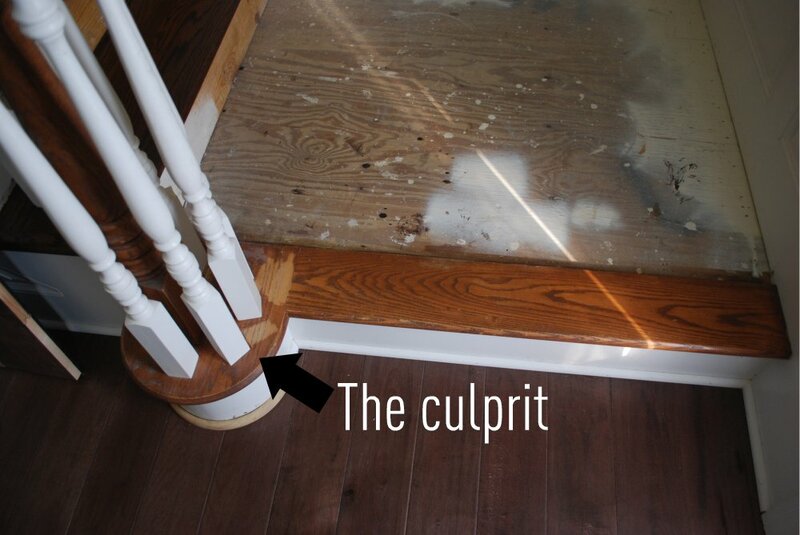 Remove spindles from annoying piece of wood so that it can also be sanded and stained to match. I want to thank all of you who weighed in on my grasscloth wallpaper dilemma. I so appreciate all the comments and e-mails. I apologize if I didn't respond to everyone. P.Daddy was out of town, there were a gazillion school projects, games and practices... you know the drill... and people in and out working on the floors... blogging had to take a backseat. I laughed when a few of you wrote to me about this bedroom on House of Turquoise. I had seen that room too, and the first thing I noticed was that the grasscloth had some funky color variation like mine. It's so nice to know I'm not alone! And, in case I haven't said it lately, I so appreciate all of you who take the time to read my little ole blog. I can't believe there are 300 people crazy kind enough to follow my chaos! You're the best!! I really enjoy reading your blog!! I promise that I'm not just saying that to be nice either. I love your new floors!!! When we had new flooring put in, we left the staircase alone. After seeing what you're going through with yours, I'm glad we did. However, when you get yours done, I'll be jealous. Mine still has carpet on them. Yours are coming along. Who knew staircases could be so expensive? I also LOVE your sofa! I want it! The room looks soooooo good with the new floor and wall color. There is always a glitch in renovating. I don't think it ever goes smoothly. At least your loss of sleep came up with a brilliant idea. The floors really tuned out beautiful! I bet you're relieved that's done. We just started on our kitchen...it's a long road and the busiest room of the house! They turned out beautiful. Glad you came up with an alterative to $7000. Enjoy! great floors. please refresh my memory, what was your final decision ...brand, stain, etc. THANKS! Thanks, ladies! M ... the floors are Columbia Chatham Timeworn solid 5" plank in Dockside Maple. Don't ya hate it when a "simple" project turns into a fiasco? Floors look great and I know you're loving them! I hope to get back to blogging soon! Take care! I am soooo in love with those floors! I was just looking at mine and wishing for darker floors. Can't wait to catch up on your blog. It's beautiful here! It is just gorgeous! I am so sorry about all the headaches and so glad that you didn't have to spend $7000! The stairs turned out beautiful. Always a few bumbs int he road! BUT WOW, it all looks so stunning. Love the new floors.